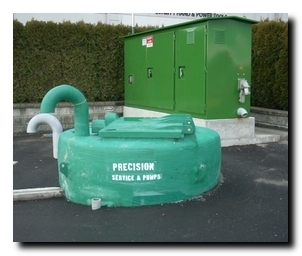 Covering the Municipal and Industrial Markets, Precision Service & Pumps Inc. provides Fiberglass Reinforced Plastic (FRP) solutions that aid in the processing of Water and Wastewater Treatment. FRP plays a major role in this complex industry, and the ability to provide a finished product to these market segments, sets our company apart from others in the industry. Our turn-key in-ground ready lift station tanks are designed for strength, with rib structure and a wall thickness designed to allow for burial. The chamber is completly finished inside and out, then we install all the internal hardware in place according to the clients job specifications. Once the unit is complete we then deliver it to your site and it is ready for placement , connection and start up. FRP tanks are available for a variety of applications such as potable water storage, rainwater collection and irrigation, sewage holding,and septic tanks vertical or horizontal. 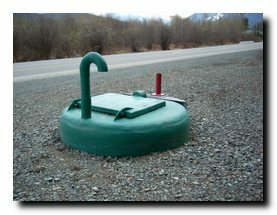 Tanks are designed and engineered for underground burial with the standard tank capable of 2 ft. of earth cover. By special order the tanks can be buried up to 7 ft. of earth cover or more. Excellent resistance to a variety of fluidic systems, additional liners and coating not usually required, biggest distinguishing factor over conventional pipe. 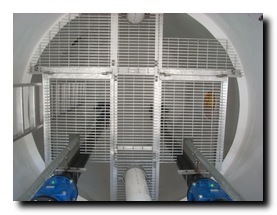 Very high ratio - excellent efficiency, Surpasses cast iron, steel, stainless steel and concrete. Better fatigue endurance limits than metals, Flatter S-N curve characteristics. Comparable pipe weight 10 % of concrete pipe, Comparable pipe weight 25 % of steel pipe, Lower shipping, handling and transportation weight, Reduced energy requirements due to lower weight. Non-conductive electrical properties, Conductive properties may be tailored into design. Maintains critical dimensional tolerances well, More adaptable than conventional materials, Highly adaptable to complex shapes and contours. Does not undergo corrosive attack over time, Easier to clean and maintain smooth wall conditions, Minimal environmental protection required.